Salman Khan’s Bigg Boss 7 saath with the tag line “Jannat Ka Wow Aur Jahanum Ka Aao” inaugurated with big WOW! Salman as usual was smart and witty with his audience and his contestants. Salman Khan forth time show host proves he is still a heartthrob and in demand. Just love him!!! OK… coming back to the show, the so called Flamboyant Fifteen inmates of this season are nothing more than just bunch of losers and people who were out of sight from us (audience). They all want to make a fresh start in their fields and want us to acknowledge them. So let’s give them a chance and see if they can win our hearts or at-least entertain us in this one show. Now the house, which is WOW… both the sides I mean. Jannat side of the house is luxury and with very funky interiors. Jahanum side is typical desi style house. So I will not call it Jahanum….its desi for me, like my nani’s old house. Tanisha Mukherjee sister of Bollywood Actress Kajol Mukherjee. (In house to shed those extra kilos on her bum and thighs). VJ Andy, host of Channel V show Dare 2 date. (In house to prove that he is not less than Imam Siddiqui from Bigg Boss 6). Shilpa Sakhlani Actress known for television soap Kyunki Saas Bhi Kabhi Bahu Thi. She’s married to actor Apurva Agnihotri. (In house to prove herself innocent in drug case). Gauhar Khan Actress, model, dancer and VJ known for item numbers in many movies and her debut movie Rocket Singh. She’s sister of actress Nigaar Khan. She is also a live performer in Zangoora. (In house to show attitude). Sangram Singh, Indian Wrestler and a reality TV actor. Live in boyfriend of actress Payal Rohatgi. (In house for a new girlfriend). Rajat Rawail, Indian producer known for producing films like Ready and No Problem. (In house to get six packs). Anita Advani, who was in news for claiming herself as a live-in-partner of actor Rajesh Khanna after his death. (In house to attest her relationship). Apoorva Agnihotari Actor known for films like Pardes, Pyaar Koi Khel Nahin and television soap Jassi Jaissi Koi Nahin. Married to Shilpa Saklani. (In house to prove that he doesn’t do drugs). Kushal Tandon, TV actor of Ek Hazaaron Mein Meri Behna Hai. (In house to get rid of alcoholism). Armaan Kohli, Bollywood actor and son of famous Indian director and producer Rajkumar Kohli, he is most commonly known for his roles in Virodhi and Jaani Dushman: Ek Anokhi Kahani. (In house for reasons best known to him. Soon whole world will know). Ratan Rajput best known for her shows Agle Janam Mohe Bitiya Hi Kijo, Radhaa Ki Betiyaan Kuch Kar Dikhayengi and reality show Ratan Ka Rishta. Soon will be seen in Mahabharat as Amba. (In house for some eyeballs). 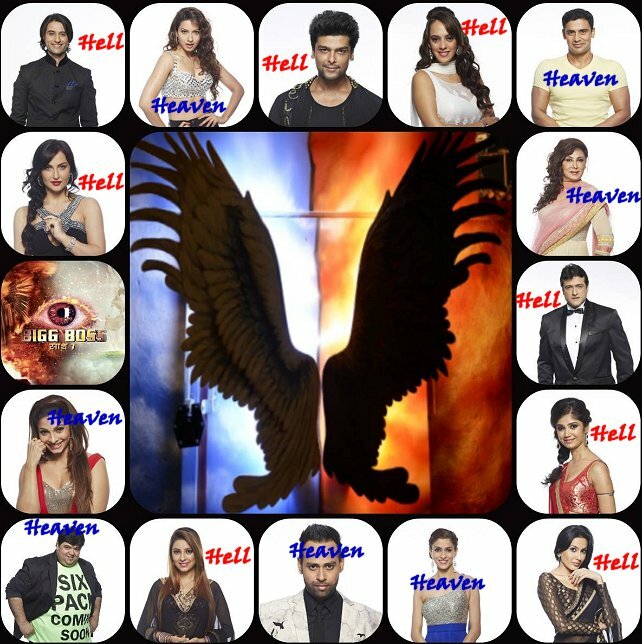 Tonight we’ll see true colours of Heaven inmates, when they will nominate 2 people from Hell. Let’s see what reason inmates give to nominate those two and who is the first one to go? Aao…. !